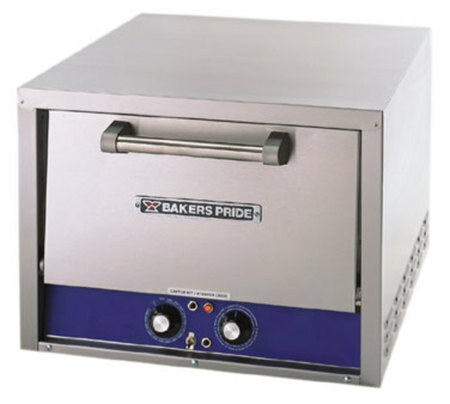 I'll be getting a Bakers Pride P18 countertop oven in a few days. The 120V model that uses a regular outlet. After looking at the oven specs I noticed it says the oven it suitable for parbaking. I'm guessing that oven is probably underpowered for a high volume commercial environment. At most I'll be making a few pizzas at a time. I'm curious to know if the oven will be able to handle a full bake, as opposed to par baking, for a few pizzas. This oven will handle full bakes without a hitch Raj. We have done 300+ pizzas in the quad deck version of this Bakers Pride over a 9 hour evening without issue. Hi Uriah-- I've noticed that over the last couple of weeks. Just made about 10-12 pies-- 2-3 on my outdoor oven, the rest in the Bakers Pride countertop, and it held up like a champ. Even made a Detroit style. 2 of the people who joiend tonight are moving to Austin in 3 weeks. First time trying Detroit style and they were blown away. I told about Via 313! Thanks for your two cents Fred. I've had the oven for a few weeks now and my results are pretty consistent with Uriah's. I've found that the oven heats up quick and gets well above 300F. I haven't cranked it all the way, but I've gotten in up to 550-600F. Even though it maxes out at 650, I think it'll get closer to 700. Raj, just wondered how this was working out for you? I am looking to get the P18 to do par baked Stromboli, so shouldn't be a problem there, but I am also wanting to cook fresh dough pretzels in it. It needs to be consistently 600 degrees for the pretzels. 120 Volt would be much more convenient since I go to events, but I don't want to have to wait for it to get to 600 for hours, or not stay at that temp consistently. What's your experience been with it since you've had it for a while now. Thanks. I absolutely love this oven. It'll get to temperature pretty quickly and stay there. For pretzels you'll be just fine. I've had the oven for about a year. It's for personal use, but when I have people over, I'll make 8 or 10 pizzas in a relatively short amount of time and have had absolutely no trouble with it. I'd highly recommend this oven.